THERE WAS ONCE A BEAR CUB WHO LIVED WITH A LITTLE BOY. A chubby little cubbie fits into a human house, but a full-grown bear can be a problem. He eats all the food in the fridge. He swamps the fish pond. He even growls scarily when he's angry, The boy takes stock of Bear. He's obviously outgrown the house. "I THINK IT'S TIME WE FIND A PLACE WHERE YOU CAN BE BIG AND BEARISH. People love bears in circuses. But Bear doesn't love the circus. The toy shop? The woods? The zoo? The jungle? A cave? While they're thinking, the boy and Bear share a popsicle. Bear loves it! And the boy suddenly knows just where a big white bear belongs. Bear concurs. Of course. Bear is a polar bear and he finds a home closer to the North Pole a perfect fit. The two best friends stay in touch with long telephone conversations, until one day Bear has a surprising suggestion that the two go somewhere together. But, where? Sophy Henn's Where Bear? 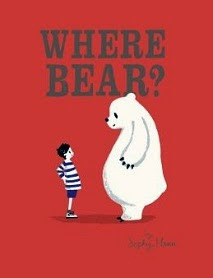 (Penguin Group, 2015) seems to end with a question mark, until and unless... the reader turns to the collophon page, where a small illustration shows boy and bear, from the back, carrying their luggage through a door which says DEPARTURES. Oh, the places they will go! Henn's pudgy white bear and boy in striped polo shirt are mostly shown face to face as they work out the wrinkles in their unusual friendship. Friends have differences, and working out ways to stay friends is one of the marvels of friendship itself, and Henn's illustrations portray that negotiation process humorously and charmingly. The New York Times reviewer says "Henn's sophisticated matte-toned illustrations make for a zippy take on the 'finding your place' genre."